Vitamin K was first discovered around 1930 and has since been commonly known for its role in coagulation or blood clotting. It is used to treat bleeding conditions resulting from jaundice or other liver dysfunctions. It has also been used to treat newborns in order to prevent bleeding. Scientists used to believe that only one type of vitamin K existed; however, several years after vitamin K was originally discovered, it was later determined that there are two types of vitamin K: K1 (phylloquinone) and K2 (menaquinone). A deficiency in vitamin K1 is almost impossible, whereas a vitamin K2 deficiency is more common. However, it is important to understand the needs of vitamin K and the other health benefits it may provide, such as promoting bone health. Many studies have evaluated the effects vitamin K may have on promoting good bone health. Vitamin K is thought to have a critical role in promoting bone growth and preventing bone loss. It acts as a cofactor in a series of reactions taking place, which are responsible for binding calcium and forming the bones. Vitamin K may also play a role in inhibiting osteoclast activity. Osteoclasts are the cells that are responsible for breaking down the bone. Therefore, vitamin K plays a role in reducing the breakdown of the bone and reducing the production of more of these cells. Several epidemiological studies have evaluated the effects vitamin K intake or supplementation has on bone density and fracture risk. The Nurses’ Health Study, involving over 70,000 participants, found that those consuming the lowest amount of vitamin K had an increased risk of hip fractures compared with individuals consuming the highest amount of vitamin K.
In the Framingham Heart Study, researchers evaluated the association between vitamin K intake and the risk of fractures among men and women with an average age of 75. They found that lower intakes of vitamin K were associated with increased risks of hip fractures but no association was found with bone mineral density. In a younger cohort of female individuals with an average age of 59, researchers found that increased vitamin K intake was associated with bone mineral density. 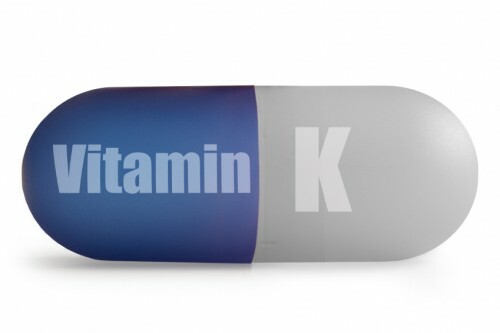 Overall, vitamin K may have beneficial effects and individuals may need higher intakes than what is recommended. However, over-consuming vitamin K will not provide additional health benefits. For people who eat high amounts of leafy greens, they are also likely consuming healthy diets overall with foods rich in calcium, magnesium, and potassium. Therefore, the benefits may be a result of the combination of all these nutrients. Randomized control trials did not seem to elicit any additional benefits when individuals supplemented their diets with vitamin K1 in addition to calcium and vitamin D. When supplementing with vitamin K2, one study demonstrated beneficial effects on the bone mineral density of the spine and femoral neck, as well as decreased incidences of clinical fractures. However, another trial study showed no benefits. One clinical trial involving postmenopausal women demonstrated decreased bone loss, whereas another trial showed no significant changes. As you can see, there are inconsistent findings among the many studies and trials that have investigated the beneficial effects vitamin K consumption or supplementation may have on bone health. You may choose to supplement with vitamin K if your diet does not seem to consist of an adequate intake. Supplementing could improve bone healthy (likely without any adverse health outcomes). However, some individuals have reported instances of gastrointestinal symptoms, constipation, and body weight. Make sure to speak with your physician before choosing to take any supplements though. On the other hand, a diet rich in green leafy vegetables can provide many health benefits and is highly encouraged. Further research trials and studies are warranted to better understand and determine the role vitamin K plays in promoting good bone health. Where Can You Find Vitamin K? Vitamin K1 can be found in the dark leaves of your green vegetables such as alfalfa, Swiss chard, spinach, broccoli, and kale. It can also be found in fruit such as avocado, kiwi, and green grapes, in herbs such as parsley and cilantro, in green and herbal teas, as well as some oils such as soybean, canola and olive oils. Vitamin K2 is mostly derived from endogenous sources, meaning that your body is able to produce it internally. It may also be found in some cheeses, meats, fish, dairy, eggs, and fermented foods like fermented soy. It is recommended that women consume 90 micrograms of vitamin K daily, whereas men should consume 120 micrograms. However, these recommendations do not guarantee that individuals will maintain an adequate vitamin K status. There are other factors that need to be considered such as age. Older adults are at an increased risk for low intakes. Jacob, A., “Vitamin K2- A little-known nutrient can make a big difference in heart and bone health,” Today’s Dietitian, 2013; 15(6):54. Shah, K., et al., “Vitamin K and bone health in older adults,” Journal of Nutrition in Gerontology and Geriatrics, 2014; 33(1):10-22.